I just created a new function, fancyTree, in which I intend to build in some custom wrappers to ape plot.phylo as well as phytools functions plotTree, plotSimmap, and phenogram to help phytools users draw special types of "fancy" phylogenetic trees. 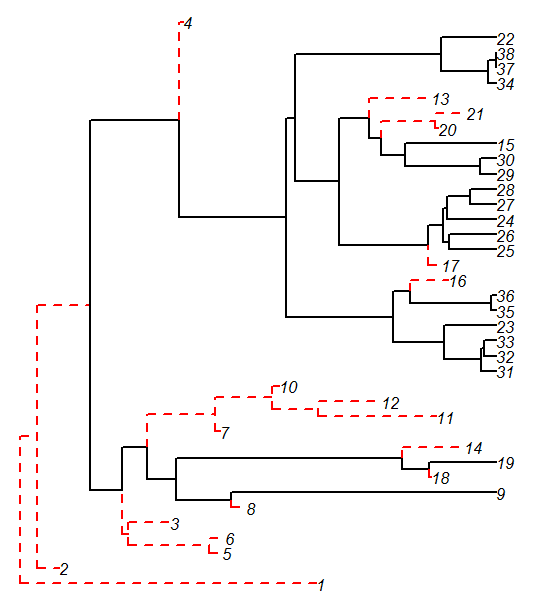 I'm open to suggestions, of course, but my first idea was to create a function that would allow users to plot phylogenies containing extinct taxa (lineages terminating before the end of the tree) in a matter so as to highlight these branches. In particular, let's say we want to color branches of the tree leading either only to extinct taxa or proceeding in time the MRCA of all extant taxa in the tree a different color than the remaining branches (i.e, branches descended from the MRCA of all extant species and leading to extant species). Note that there is some admittedly lazy programming above, because as soon as we visit an edge with no extant descendants, we should not visit any of its descendants, but we do anyway! This should be a simple thing to fix. That's pretty much it. We can then use plot.phylo to create our tree, and voila! Code for this function can be downloaded from my phytools page and should be in the next version of the package.